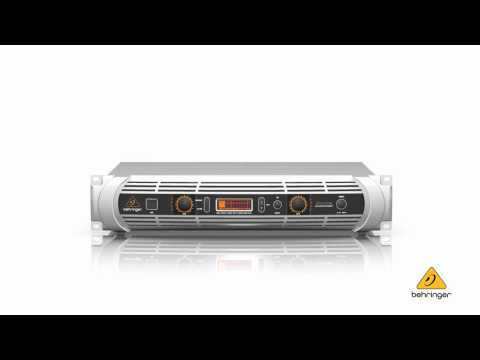 The iNUKE NU6000DSP power amplifier packs 6,000 Watts (2 x 3,100 Watts @ 4 Ohms; 2 x 1,600 Watts @ 8 Ohms) into exceptionally lightweight (12 lbs/5.5 kg) and rack-mountable packages. Plus, the built-in DSP and 24-bit/96 kHz converters ensure the ultimate signal integrity with an extremely broad dynamic range. And because the NU6000DSP is so much more efficient than conventional designs, it runs cooler and doesn’t require the massive heat sinks and heavy toroid transformers typically associated with its conventional counterparts. Thanks to our “Zero-Attack” limiters, which offer maximum output level with exceptionally-reliable overload protection, you can run the NU6000DSP full-out for hours on-end. Our revolutionary high- density Class-D technology, combined with ultra-efficient, switch-mode power supplies, ensures this feather-light powerhouse will drive your rig effortlessly for many years to come. The front panel controls and indicators provide your system’s vital signs at a glance. After pressing the Power button, the Power LED lights to show the amp is ready for action. All channels feature positive-detent Gain controls with Signal LEDs that light when a signal is present, as well as Clip LEDs to indicate when the signal is distorted and you need to reduce the input signal. Just as elegant as the front, the rear panel is home to the combo XLR and 1⁄4" TRS Input connectors, making the iNUKE compatible with virtually any source, balanced or unbalanced. Professional twist- lock speaker sockets are provided to ensure every drop of output power gets to your loudspeakers. The rear panel is also where you’ll find the switches that enable the NU6000DSP amp to run in your choice of dual mono, stereo or mono bridge modes. For sound engineers requiring high-level control capability, the NU6000DSP amplifier comes ready for action right out-of-the-box. The built-in DSP and 24-bit/96 kHz converters ensure the ultimate signal integrity with an extremely broad dynamic range. DSP functions include a sophisticated delay for delay-line loudspeakers, crossover, EQ (8 parametric, 2 dynamic), and dynamics processing with lockable security settings. A convenient front panel LCD display allows you to setup and make adjustments directly at the amplifier, without the need for a PC. You can also set up, control and monitor your NU6000DSP amplifiers using your computer via USB – and immediately gain access to a whole new level of amplifier control. iNUKE Remote Connect software is the ideal way to manage installed systems, and to set up presets for live sound and production environments. Click to download the iNuke Remote Connect software.